This is a general discussion area for those who are interested in Chris-Craft's connection with Gar Wood, the man, and the Company. Not sure if the gauge panel on my 1929 28-30 is correct. The dash and panel look original to the boat but I have not seen the same gauge cluster in other Gar Woods. Before I have the panel restored I want to make sure it is correct. I'm not the Gar Wood expert but my 1931 28-40 had a Consolidated panel. You could have the wrong panel. Or perhaps your boat might just use the three hole version. I'm sorry but that is not the right panel for your boat. What you have is a 5-unit Stewart-Warner panel introduced in the early 1930s. The 1929 28-30 models had individual gauges (the 28-40s did use an oval Reliance panel). 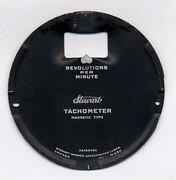 The rolling barrel Stewart tach was similar to what Model A Ford cars used. I am not sure what brand the other individual gauges were, but I will look. They were 2-inch Oil Pres., Amp, and Water Temp. For 1930-1933 the 28-foot Gars used a Consolidated panel, similar, but fancier than the Stewart-Warner one you have. Good news is I don't have to spring for a panel restoration. My dash looks correct someone just put a panel into it. Does the tach in the picture look correct? Was there a push button to start the engine? It takes what is known as a 'barrel' tach made by Stewart. Yes, there was a black start button between the ammeter and tach. And a light bulb fixture above the tach. Thank you Brian. In the dash you posted, is the hole to the left of tach for the start button? Would it be the same start button on my 16-35 pictured below? Yes and yes. The one in my pic had been changed. My transom bands were 14gauge and beveled to almost nothing on the forward edge. Was this original? They also appear to have been cut off just below the splash rail; I presume they should extend all the way to the chine. Steering wheel is made of Walnut, should it be stained the color of the hull or something different? Does anyone have a good picture of 1920's Delco Remy push pull switch? cenger wrote: Does anyone have a good picture of 1920's Delco Remy push pull switch? Can someone tell me the correct number of step pads on a 1929 Gaw wood triple? I have a 1929 brochure that shows 4 but many of the boats I see have 6. Not sure what is correct? Back to the panel conversation; I have been able to locate the correct oval Reliance panel for a 1929 28-40 but had a few questions about the color of the panel and gauges as well as the ignition switch. I have seen pictures of a ‘29 Gar Wood oval Reliance panel with a white panel and black gauges and a Gar with a black panel with black gauges. Dodge used the oval Reliance panel with a black background and white faces (sharp!). Mark Clawson recall’s Gar Wood using a black background with white amp, temp and oil with a black tach but was not certain. Hoping an expert is out there than can provide the definitive color combination. Also, did Gar Wood have any writing on the gauge panel like Dodge used? For the ignition switch, Gar Wood used a Buick switch, was there any logo or writing on the ignition switch? Any help would be greatly appreciated.